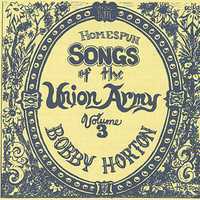 This volume is the third in my series of Union Army tunes. Music was an important escape from the horrors of a very bloody war and also a source of hope for soldiers and civilians alike. Included here are samples of several different types of songs from the period of 1860-1865. Like all others, I played each instrument, sang each part, did the liner notes and cover art by hand, and recorded here in my home production studio on a Fostex 8 channel analogue recorder – hence the "Homespun" in the title.